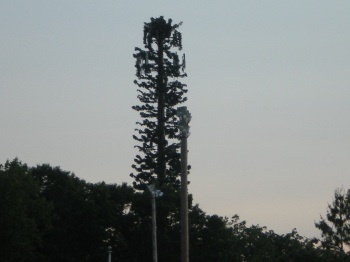 Some yahoo at the local planning board forced the carrier to put up this beautiful cell tower tree. Sure, the rent on cell tower lease that the landlord gets is no different on a stealth tree pole than on a monopole of a lattice tower, but a thing of beauty such as this tower costs the carriers a few hundred thousand dollars more than a regular cell site to build. It's the carrier's way of giving the zoning and planning folks a big middle finger and thank you. If you are a municipality and need assistance in properly developing a cell tower site or putting out a cellular bid to develop town properties, please contact Tower Genius at 888-313-9750. No way this tower gets 5 stars.